Red 5 Studios CEO Mark Kern "no longer [has] any authority to act for or on behalf of Red 5 Studios". According to a recent report, Mark Kern has been voted out as Red 5 Studios CEO by its own board of directors. Kern's departure was revealed earlier today thanks to a leaked email written by VP of Development James Macauley, forwarded "by a source close to the situation". Red 5 Studios has undergone recent layoffs and restructuring after its acquisition by The9, but the news is still surprising, given that Kern co-founded the studio alongside former World of Warcraft employees. Today, the Red 5 Studios Board of Directors met and after deliberation have decided that Mark Kern will no longer be the Chief Executive Officer or on the Board of Red 5 Studios. Effective immediately Mark will no longer have any authority to act for or on behalf of Red 5 Studios. As one of the founders of Red 5 Studios and our leader for many, many years, we owe Mark a great deal of appreciation for all that he has done to help build this company and to set the vision for an incredible new game. I am personally grateful for my relationship with Mark and the many years I have worked with him. This is a major change to our company. Your managers and I will set to work to cover any and all areas that Mark was directly handling and we are continuing to solidify the plan for 2014. I assure you that we are and will continue to be here to serve and support each of you. We will be holding a team meeting to discuss this topic at 11:15 a.m. tomorrow but I wanted to make sure you were officially informed of this significant change to your company. Please grab me or any of the managers at any time or give us a call if you would like to discuss in private. Please refrain from discussing this topic outside the company. 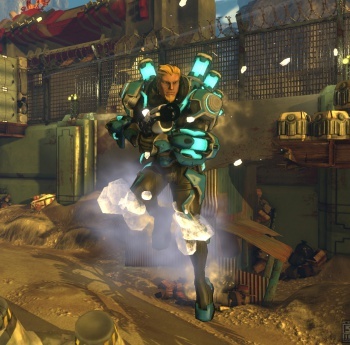 Before this announcement, Kern had been working on Red 5 Studios' open beta of Firefall. We will follow up with additional information as it develops.